Small, simple, and powerful. Say hello to Google Home Mini. This helpful voice-activated smart home speaker is powered by Google Assistant, giving you hands-free control of your smart home, including Nest, Philips Hue, Belkin, and WeMo devices. Ask the Mini questions, tell it do things, and get answers from Google using only your voice. Very useful more than I thought it would be. The Google mini and it's bigger brother the Google home are surprisingly useful. I originally purchased them as I was curious about their usefulness for those with physical disabilities but who could speak clearly. My personal disability Is cerebal palsy. . Currently I have five smart lights and a smart TV under their control. I soon plan to have at least one set of smart blinds connected to them as well. I know the technology is still evolving. It is quite liberating to be able to do simple everyday tasks with just your voice. It is good enough that the entire group home I am living in is considering implementing Google home in a few of their other Apartments. Additionally Google home and the Google mini are a lot of fun! All of the smart devices are in a continuous state of evolving and being updated. This technology is very promising. Highly recommend the Google mini. The sound quality for its size is also surprisingly good. Great product but not on it's own. You need to have paid subscription for music and it does't support apple music. It's also not apple devices friendly. For home lights, thermostat and other voice command functions you will need to purchase hardware and they are not cheap currently. Does't have GM key fob functionality like Alexa. Unless you are willing to switch to google products or already are using them it has very limited functionality. Product would not update and google service was not able to help. Best Buy was great took back the return without a hassle. I returned it as it's so slow compared to Alexa. Anything you ask Alexa she answers with maybe 1 second or less delay. Google Home is more like 2-3 seconds every single time. Alexa also is more useful in that she only responds saying Okay, such as "Turn on the kitchen light." Google Home never shuts up, it's "Okay, turning on the kitchen light for you, here you go!" Or if she misunderstands you "Sorry I don't know how to help with that yet, but I'm always learning." OMG like shut UP so I can repeat myself! I received a Google Home Mini as a gift (something I never saw myself buying) and I love it. Works seamlessly with my phone, chromecasts and Lifx smart lights. My best friend's kids had so much fun with it, I ended up buying one as a gift for his family. And Best Buy always ships super quickly. Can't recommend this enough. 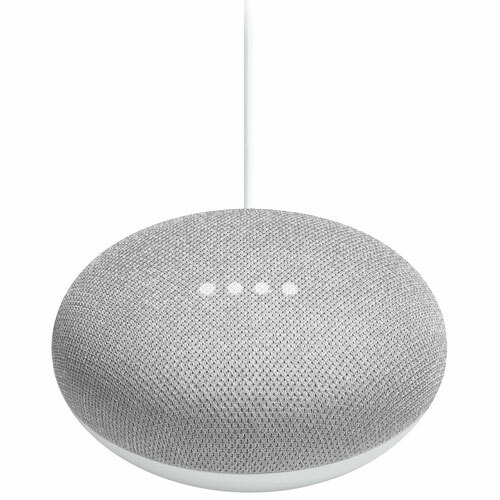 i have buy this little google home and i am very happy about it. Easy to setup and require to pay for music but thats a good feature to have. Bought this device after relative raved about it. Light and easy to set up. Was somewhat confused about setting volume but eventually reduced it. Changeable components include volume, temperature C to F, voice recognition. Interesting device with many tasks. No jack though, which I find strange.Other than that, you just plug in, download app and make minor changes. Very simple. Got this last December - crashes my 2.4G wifi network weekly even after the Jan18 Google fix. Had no Wifi issues before the mini came. I've disconnected my mini and shelved it - my wifi is good now. Premièrement, il ne comprend pas tellement de requêtes que c'en est fatiguant. L'application pour les actualités tombe carrément sur les nerfs, avec des sons soudains en plein milieu et les phrases qui finissent brusquement sans avoir terminé et passe à autre chose??? Si on lui demande une simple multiplication, il comprend une fois sur deux. Nous lui avons demandé deux fois un numéro de téléphone et les deux fois la voix disait 1945 et c'était 1145 le bon numéro, alors la prononciation laisse à désirer quelquefois. pour le Netflix, oui ça fonctionne, mais en lançant Netflix de cette façon, on ne peut plus utiliser la télécommande et on doit s'en tenir uniquement aux commandes vocales, qui sont pratiquement inutilisables si le son de la télé est un peu fort. Pas moyen de spécifier une saison si on lance une série, alors ça démarre du début. On peut dire ''épisode suivant'' mais si ont était rendu à la saison 3 épisode 10, ça fait beaucoup de ''OK google''... Même chose pour Youtube, c'est pas vraiment possible de spécifier quelque chose de précis, on peut dire Ok google lance des videos de chats sur youtube, mais si je demande ok google, lance la vidéo ''sun circle ah nee mah'' sur youtube, il me met des vidéos d'animaux...ok...pas cool. Une fois la vidéo terminée, pas moyen d'utiliser la télécommande pour entrer du texte plus précis pour la recherche. Et pour la musique, j'ai jamais réussi à lui faire lire des videos de Georges Zamphir...il me mettait de la musique de VAMPIRE!!! Bon, en conclusion, c'est loin d'être au point..une chance que c'était pas trop cher...il ne va pas servir beaucoup.. I love my new Google Home Mini. I like it so much I bought a regular size for my living room and am keeping my mini for my room! Opened it and started playing with it while I was with my 71 year old Grandmother and at first she thought it was just a way for people to be lazy, but the more she saw it could do, the more impressed she was! Ended up getting me to pick one up for her because she doesn't need to techie at all, she can just speak and the mini helps her out with setting timers, alarms, remembering where things are, and finding her cell phone. It's a fantastic tool for anyone, any age group, any technology level! I love the entire line! My home will slowly be switching to more and more smart tech! Best buy is stealing your money. We got our google home mini about a month ago. the Speaker part has already gotten a lot quieter than it was when it was brand new. Although it is funny, we tend to ask it a lot of simple questions that it is unable to answer. I also find it incredibly stupid how you can't tell it to play music unless you pay extra. Super deal when it is on sale. I got three of these and they all work perfectly. It is amazing what you can do with this Assistant. Check out my full review and installation video here: https://youtu.be/lbxuKVrp-R0 The Google Home App is great. I love gadgets, but there are very few things that I fall IN love with. I was skeptical at fist, but this is one product I fell in love with and I have these scattered all around the home. Even gifted it to my sister and parents. If you are comparing this with echo dot, please don't bother. I used both, but returned the echo. I use this to set reminders, ask for weather, news, set timers for cooking, laundry etc.., broadcast messages to other google home devices. Ask for directions which it helpfully tells me and then sends directions right to my phone. Also works with public transit directions. The sound is decent - I quite like it. I have it connected to nest thermostat - tells temperature, can control it too, but 9/10 doesn't does not tell me what it is SET TO It's not perfect though - Canadian features are far less than US. There are many simple things that it can't do, but the list of abilities will grow for sure. Negatives -...skynet?? If you are Chromecast user like we are, then this is a great investment. We use GHM to control 8 Chromecast speakers and 4 Chromecast TVS. Its got great voice recognition so it knows who is talking to it, and even my young kids can turn on Spotify when they want to listen to their music. Very impressed. Especially for the current sale price! That is really the best toy ever that it can help me to tackle problems in my life. However, there is a problem with playing Spotify. Use the google home app, add another account, and train it. This is absolutely amazing product from Google. Let's go for a quick and to the point review. 1. Great Range. (Distance from Speaker) 2. Best voice recognition. 3. Answer to almost everything. 4. Great Customization options. 5. Can handle up to 6 different person at any time. 6. Speaker quality is also very nice. This little donut sized genius has changed my life. I really do rely on her a lot! From times, dates, routes, to the little things like playing games to pass the time or even having a conversation when I'm lonely, it's useful. She even finds my phone for me when I lose it! Best investment! What I was expecting was some juvenile piece of gimmick that would annoy me when others would chime in with their Hey Google (Im) maturity for lack of better reasoning. Now on day 2 I'm doing the 180 degree thing because of how it (she) pulls me deeper into allowing I to flex my thinking or could I say expand her usefulness and uselessness for me. For example, I already have Lutron light switches that with the aid of Lutron's app automates my lighting or "scenes" to turn on and off the lights at intervals I create. Google (she) enhances this by giving me full control of lighting (dimness/on-off, color) per voice! She must be within ear shot albeit but she's pretty good at listening over noise at great distance. Streaming Tunein Radio al'la voice won me over instantly and was the single most thing that sold me thank you very much. Sounds quality is exactly on par with what you could expect from a donut, it's listenable all day and never made me feel that feeling of regret that other devices have given me. Do note that it doesn't have an internal battery making it a speaker that always (at least what the instructions said), needs to be plugged into the included power adapter to work. This is not entirely true as I learned. Being that it has micro - usb to power it I connected the donut to a portable battery phone charger (10,000 mah) and it played all day today while I worked on my deck. The charger burned 1 bar (of 4) of power! BONUS. All said it feels like it would if you could have Scotty "beam me up". In other words it's a very powerful yet very fun donut. Good speaker good volume with little distortion, and still responds to a hail with sound on, Google chrome compatible so it can control Netflix and YouTube on your television, and it works well in Canada. Has voice recognition application that allows you keep personal schedules and information available only to your voice print. Looks good and has low profile so it doesn't dominate the room, great way to put a connected voice AI through out your house for music, to activate lights and other switches. Can make phone calls in Canada, and it allows you to pair to a local land line or cell number.